Editor's note: Our crack reporters, Sam Biddle and Mario Aguilar, were so eager to break the news of a $7,000 ping pong table that they each wrote about it at the same time. Oops. Gizmodo presents their duplicate efforts as if the words themselves are a ball being batted back and forth across a table. Sam: OK, so, yeah, maybe seven grand is a lot to spend on a ping pong table. But consider this: If you truly love ping pong, don't you want a table that will last can last tens of thousands of years? Mario: Concrete and steel seems a little excessive—it's indestructible stuff, usually installed in parks. Except this concrete is for the elite, and not the people. 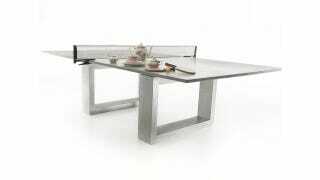 Sam: This is the Ping Pong Dining Table by James De Wulf—because, hell yeah, you can pull some chairs up to this thing and eat a sandwich or two. Mario: If you're a real fanatic (and a millionaire), this outdoor table should help show everyone how devoted you are to the game of ping pong. Sam: This might be a little more durability than you need from something you typically put in your basement—but now you can put it outside! And even if there's a bombing raid, a spell of acid rain, or some other cataclysm, your regulation table will be safe. Mario: Phew! For a second there we were worried this was a waste of money.